| educated at Reading school. 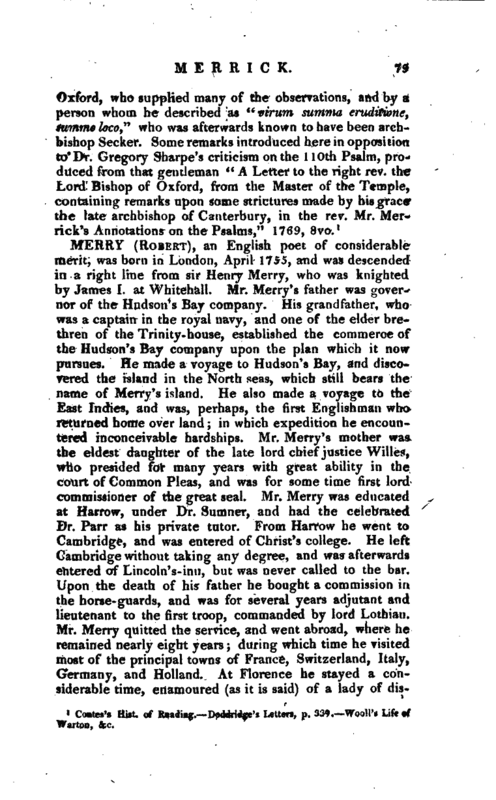 After being opposed, (very unjustly according to his biographer) as a candidate for a scholarship at St. John’s, on sir Thomas White’s foundation, he was entered at Trinity-college, Oxford, April 14, 1736, and admitted a scholar June 6, 1737. He took the degree of B. A. in Dec. 1739, of M. A. in Nov. 1742, and was chosen a probationer fellow in May 1 744. The celebrated lord North, and the late lord Dartmouth, were his pupils at this college. He entered into holy orders, but never engaged in any parochial duty, being subject 10 acute pains in his head, frequent lassitude, and feverish complaints; but, from the few manuscript sermons which he left behind him, appears to have preached occasionally in 1747, 1748, and 1749. His life chiefly passed in study and literary correspondence, and much of his time and property were employed on acts of benevolence. Few men have been mentioned with higher praise by all who knew him*. He had an extraordinary faculty of exact memory; had great good nature, and a flow of genuine wit; his charity was extensive, and his piety most exemplary. 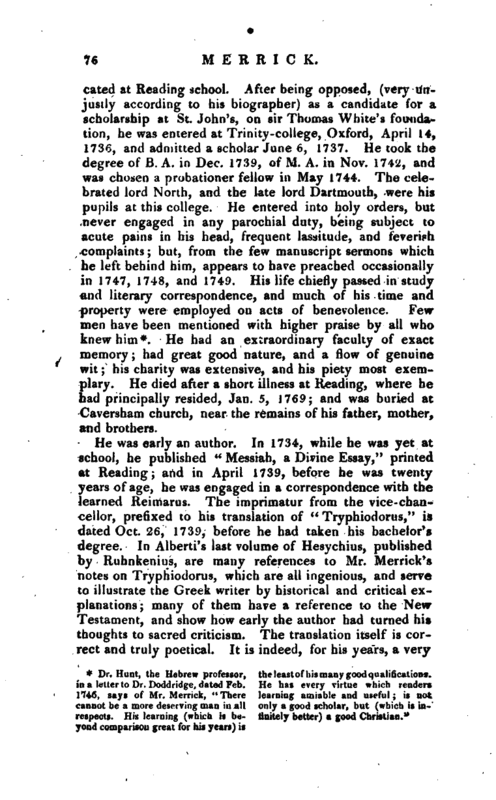 He died after a short illness at Reading, where he had principally resided, Jan. 5, 1769; and was buried at Caversham church, near the remains of his father, mother, and brothers. * Dr. Hunt, the Hebrew professor, the least of his many good qualifications. cannot be a more deserving man in all only a good scholar, but (which is iarespects. His learning (which is be- finitely better) a good Christian." yond comparison great for his years) is | extraordinary proof of classical erudition and taste, and was deservedly supported by a more numerous list of subscribers than perhaps any work of the time. It was handsomely printed in an 8vo volume, at the Clarendon press, but without date or publisher’s name. 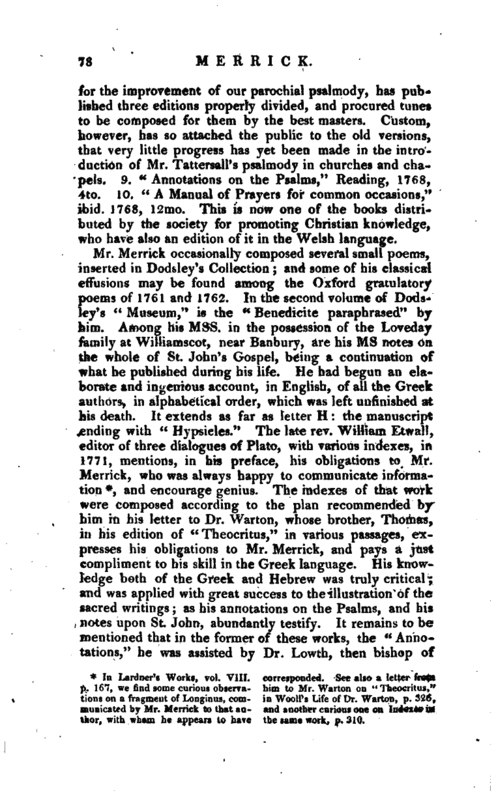 The rest of Mr. Merrick’s works were published in the following order: 1. “A Dissertation on Proverbs, chapter ix. containing occasional remarks on other passages in sacred and profane writers,” 1744, 4to. 2. “Prayers for a time of Earthquakes and violent Floods,” a small tract, printed at London in 1756, when the earthquake at Lisbon had made a very serious impression on the public rnind. 3. “An encouragement to a good life; particularly addressed to some soldiers quartered at Reading,” 1759. 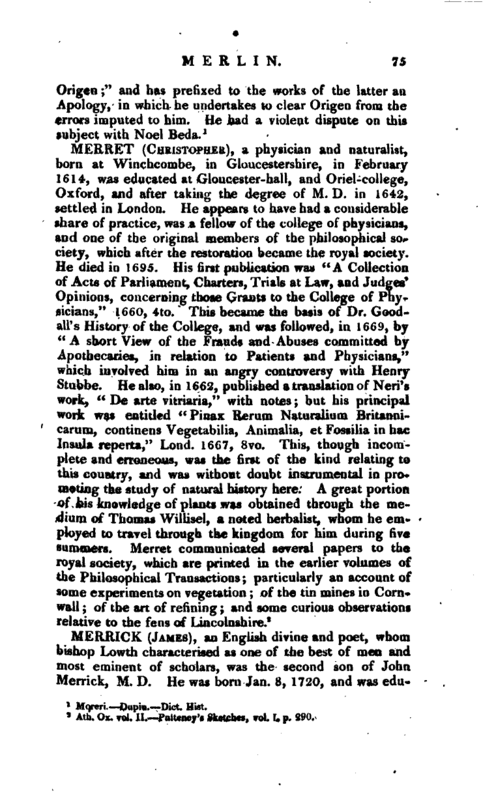 His biographer informs us that a list is still preserved of the names of many thousand soldiers, whom Mr. Merrick had instructed in religious duties, and to whom he had distributed pious books. 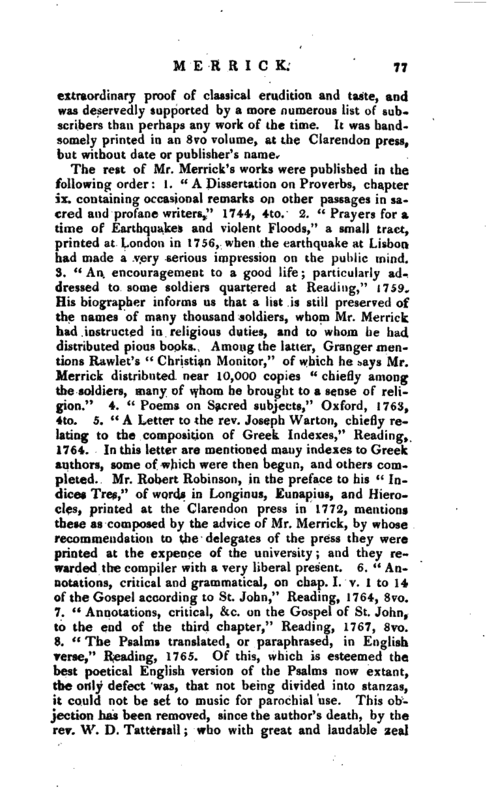 Among the latter, Granger mentions Rawlet’s “Christian Monitor,” of which he says Mr. Merrick distributed near 10,000 copies “chiefly among the soldiers, many of whom he brought to a sense of religion.” 4. “Poems on Sacred subjects,” Oxford, 1763, 4to. 5. “‘A Letter to the rev. Joseph Warton, chiefly relating to the composition of Greek Indexes,” Reading, 1764. In this letter are mentioned many indexes to Greek authors, some of which were then begun, and others completed. Mr. Robert Robinson, in the preface to his “Indices Tres,” of words in Longinus, Eunapius, and Hierocles, printed at the Clarendon press in 1772, mentions these as composed by the advice of Mr. Merrick, by whose recommendation to the delegates of the press they were printed at the expence of the university; and they rewarded the compiler with a very liberal present. 6. “Annotations, critical and grammatical, on chap. I. v. 1 to 14 of the Gospel according to St. John,” Reading, 1764, 8vo. 7. “Annotations, critical, &c. on the Gospel of St. John, to the end of the third chapter,” Reading, 1767, 8vo. 8. “The Psalms translated, or paraphrased, in English verse,” Reading, 1765. Of this, which is esteemed the best poetical English version of the Psalms now extant, the only defect was, that not being divided into stanzas, it could not be set to music for parochial use. This objection has been removed, since the author’s death, by the rev. W. D. Tfcttersall; who with great and laudable zeal | for the improvement of our parochial psalmody, has published three editions properly divided, and procured tunes to be composed for them by the best masters. Custom, however, has so attached the public to the old versions, that very little progress has yet been made in the introduction of Mr. Tattersall’s psalmody in churches and chapels. 9. “Annotations on the Psalms,” Reading, 1768, 4to. 10. “A Manual of Prayers for common occasions,” ibid. 1768, 12mo. This is now one of the books distributed by the society for promoting Christian knowledge, who have also an edition of it in the Welsh language. Coates’s Hist, of R*adin, Doddridjje’s Letters, p. 339 Wooll’s Life of Warton, &c.